Jessica Kensky and Rescue at home. Near the end of the new children’s book by Boston Marathon bombing survivors Jessica Kensky and Patrick Downes, a two-page spread shows Jess tossing a Frisbee on Boston Common. The digital watercolor-style illustration by Scott Magoon catches Jess in the middle of her follow-through, right arm extended, pony tail flowing behind, eyes trained on the disc. A double amputee, she stands confidently on two prosthetics, visible beneath her shorts. Nearby, Patrick enjoys a picnic with their family, on a kelly-green stretch of the park set against the Back Bay skyline. As a cheerful tableau rendered in springtime colors, it signals just how far the characters have come from the book’s somber early scenes, how remarkable a carefree day has become. By now, five years after the bombing, many people know their story, the newlyweds who lost their left legs in the attack. But the book, to be released Tuesday by Somerville’s Candlewick Press, isn’t about Jess and Patrick. It’s about Jess and her service dog Rescue, the black Lab leaping joyfully to catch the Frisbee on the facing page. In “Rescue & Jessica: A Life-Changing Friendship,” Jess reimagines herself as a tween; Patrick becomes her bespectacled kid brother, toting a toy fire truck marked “Ladder 15,” a quiet nod to the Boylston Street firehouse that responded to the bombing. RESCUE AND JESSICA: A LIFE-CHANGING FRIENDSHIP. Text copyright © 2018 by Jessica Kensky and Patrick Downes. Illustrations copyright © 2018 by Scott Magoon. Reproduced by permission of the publisher, Candlewick Press, Somerville, MA. But the bond between Jess and Rescue is authentic, a story of how he helped her laugh and find a path forward while wagging his tail as they learned to conquer everyday tasks together. It’s an evolution I’ve witnessed personally over the years as I’ve reported stories about them, and also now as their friend. In the early pages, the pictures are shadowed and moody, echoing Jess’s pain and frustration as she tries to learn to walk on one prosthetic and eventually comes to terms with the need to remove her other leg, too. Rescue, meanwhile, frets in training as a puppy about whether he’s right for the job and whether his future partner will like him. As their narratives intertwine, the illustrations become not just brighter but bigger, too, ending with three straight two-page spreads in which the illustrations fill the pages right to the edge. And though Patrick is just a background character in the story, the book itself is an effort that marries their strengths — as well as a testament to their shared recovery and an achievement hard to imagine just a few years ago. The book idea emerged as a lark during an otherwise bleak time in late 2013, when they traveled to Washington state to explore a high-tech brace designed for the military, one of a series of failed attempts to save Jess’s severely damaged right leg. While there, they had dinner with a friend, Clelia Gore, a lawyer who had recently changed careers, studying publishing at Emerson and becoming a literary agent. Wowed by Rescue, she suggested he’d make a great book. To entertain themselves, they floated sample storylines and titles at the table, an activity that continued as a regular diversion over e-mail — strictly about Rescue and his many talents, with Jess in too dark a place to imagine herself in the story, much less envision it in print. Jess’s perspective would shift well before her health improved, amid a stubbornly halting recovery. In public, she and Patrick continually drew gasps from children — staring or pointing at their prosthetics or missing limbs, more amazed than scared — as well as refreshingly frank questions. An oncology nurse before the bombing, Jess realized that a book with medically accurate as well as engaging artwork could demystify her condition, providing a safe space for kids to stare as long as they wanted. Meanwhile, she marveled time and again at Patrick’s ability to explain things to children in just the right way — at least the ones whose parents didn’t whisk them away, leaving their questions unanswered. By 2016, they had refined a manuscript with their friend Clelia, gearing it especially for readers 5 to 9. They envisioned it “as both a mirror and a window,” giving children with disabilities or differences an opportunity to see themselves and giving other young readers a chance to gain empathy and insight — subtly, while being entertained by Rescue’s wagging tail, expressive jowls, and impressive talents, like fetching phones, pushing walk buttons, and taking out the trash, as well as comforting Jess after surgery. 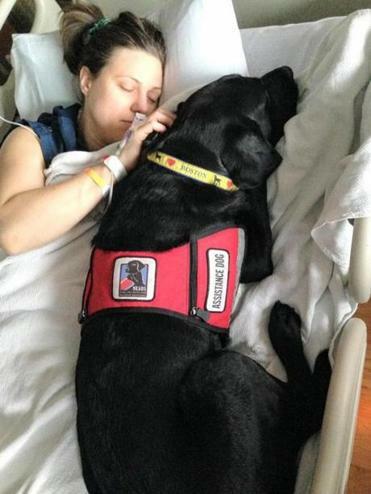 Jessica Kensky and Rescue in 2015 when Kensky underwent her second amputation. The book is deeply informed by Patrick’s doctoral training before the bombing as a clinical psychologist working with pediatric patients, including trauma survivors, learning to address difficult subjects in ways that are honest without being scary. In a carefully considered choice, “Rescue and Jessica” avoids mentioning the Boston bombing, even as it addresses Jess’s condition directly. Indeed, it does not even name Boston, though illustrator Magoon, who lives in Reading, laced the book with identifiable locales, like the Greenway and Fenway Park. 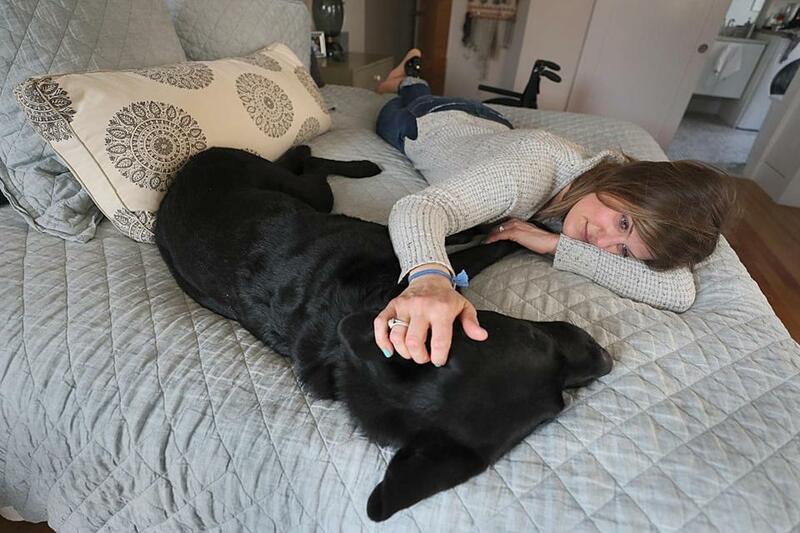 Magoon is running this year’s marathon as a fund-raiser for NEADS, the service-dog organization that trained Rescue and paired him with Jess; in 2013, he was nearing the finish when the bombs went off. “In a hospital in the city, a girl named Jessica was worried. “Both of her legs were badly hurt. Everyone hoped her right leg would heal, but the doctors had to remove part of her left leg so she could be healthy again. Refining the language, Jess and Patrick were careful to avoid phrases like “lost a leg” that might confuse or frighten young readers, making them worry suddenly that their leg could get lost as easily as a mitten. In print, the decision to make Jess a tween came from Candlewick, so children could more easily relate. But it fits with her experience, as an adult forced by the bombing to rely again on others, particularly her parents. A year ago, the real Jess still felt that way, recovering from one last surgical Hail Mary attempt in the OR, after so many previous surgeries had failed to alleviate her pain and allow her to comfortably stand on prosthetics. Which means that when she and Patrick finished the manuscript, reality was more complicated than the book’s heartwarming ending. But late last spring, her luck finally improved, and she was able to run errands and take Rescue for long walks without doubling over in pain. Last fall, she returned to work part-time at a desk job on her old floor at Massachusetts General Hospital — she may never be able to resume the patient care she loved, 12-hour shifts on her feet — while taking classes toward a doctorate. Today she feels better, and laughs more, than at any point since the bombing. As they prepare for a book tour, real life now looks a lot like the final page of the book: Rescue and Jessica walking side by side, Patrick jogging behind them, her parents easing up in the distance. Eric Moskowitz can be reached at eric.moskowitz@globe.com.